On Thursday 3 September 1914 the Cheshire Yeomanry moved from their camp at Eccleston, near Chester, to Norfolk on the east coast of England. As part of the Welsh Border Mounted Brigade they were bound for Norwich to join the 1st Mounted Division, the division being formed in August for the purpose of home defence. After a short stay at a camp at Bungay, the Cheshire Yeomanry moved to a new site at Kirby Cane Hall nearby. 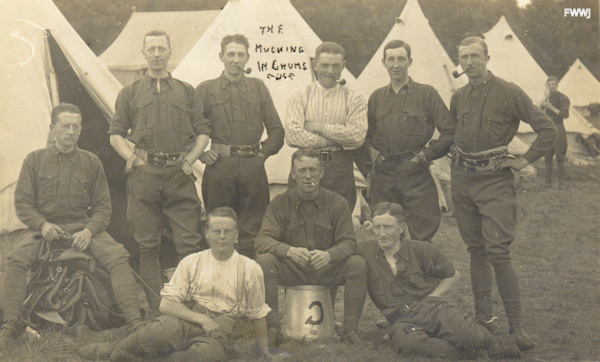 Two postcards of camp from this time survive, belonging to and featuring Thomas Minshall of “C” Squadron, Cheshire Yeomanry, along with 8 other men. Each card is simply dated “October 1914” on the reverse in Thomas’ handwriting. "C" Squadron drew from an area covering Northwich, Tarporley, Nantwich and Audlem. On 26 September 1914 the Chester Chronicle published an interesting letter by a trooper of “C” Squadron that detailed daily life in camp. “We have to do line guard about one day in every ten, which is nothing like so bad as at night, but very dull. I like the life first-rate, however; the grub is good, but very rough. When the tins come in, one to each troop, we are all round just like a pack of hounds, but there is lots fun going, and it is fine breaking-in for anyone who has a tendency to the faddy side. We have had some very rough and wet weather, but the ground soon dries, and the air is awfully bracing. We are 15 miles from Yarmouth. Up to Saturday each troop was in a big tent, but ours was blown to ribbons Saturday night, and we had to beat a retreat to a barn about a quarter of a mile away and finish the night there. “The bulk of the fellows are very good sorts, and only laugh when anything like this happens. . . . . Mr. and Mrs. Crisp at the Hall here have been awfully decent to the men. We are camped close to the Hall, and they have fitted up a large tent for our use at night. I am writing there now, and a concert is going on at the same time. Since Sunday we have had the small bell tents. We have ten in ours, Frank Moore, Minshull, Thornton, Newport, Chadwick, Goodman, my brother, self, and two others, the first eight being all from Northwich. It is very much better being together, and they call us ‘The likely lads’ in camp. “I have been very fortunate in my mount, having a splendid little mare about 15 hands, belonging to Mr. Speilburg, from Altrincham way. She has any amount of ‘go,’ rather too much at times. I hear to-night that they are taking 100 horses from us to-morrow for the regulars; only hope they will miss mine, as there are some very nasty-tempered brutes, and it is very rough on a man if he has one, and gets into rough water if the nag does not go quietly. There have been two or three nasty accidents. “When dismounting for action we have to gallop up, split into sections of four, and every third man in the section has to gallop away with the four horses, and you can quite understand that they become a bit restive. We are leaving here Saturday, I believe, but where to I have no idea. They will have to put both horses and men under cover very soon, however. We shall not be going across the water before the New Year, as far as I can gather, but one hears many tales and rumours. I think we shall move with the ‘Terriers.’ I had a letter from Cowap at Northampton the other day, and said they expected to move very soon. It is interesting to note that the correspondent identifies by surname eight (of ten) people who were in his tent. One of those identified is given a first name and some further clues on identity of others can be gained from Alan Lowe’s book, “A Call To Arms – Mid Cheshire Goes to War”. Lowe records that the Northwich Guardian of Friday, 11 September 1914, identifies four of the above named were members of the Northwich Rowing Club. These are: N. Chadwick, G. Godwin, G.Newport, and F. Thornton. Study of service records places enlistment dates for the above men between 27 August and 4 September 1914. This accords with the date of the Northwich Guardian article referred to above. Presently it appears that George Godwin’s brother may be Frederick Harold Godwin, but service records remain to be verified. Richard Minshull’s service number indicates enlistment early in 1913. In Sir Richard Verdin’s “The Cheshire Yeomanry” he is identified within the personnel of Regimental Headquarters and a motor cyclist; he and other Headquarters personnel were attached to “B” Squadron in 1916 when the Regiment was posted to Egypt. The service number for Percy places his enlistment late in 1914 or early 1915, i.e. after the above letter was published. According to Lowe the Northwich Guardian of Friday 4 September 1914 records that Thomas Minshall of the Verdin Gymnasium joined the Northwich Squadron (i.e. 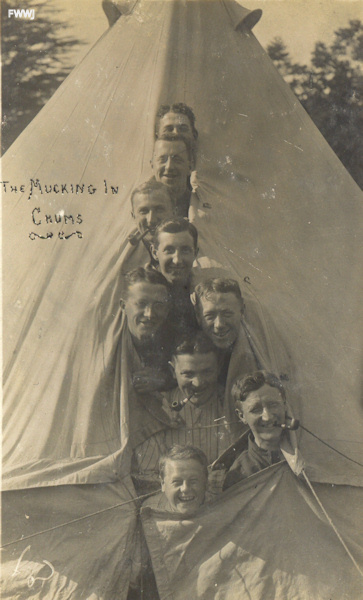 C Squadron) of the Cheshire Yeomanry. Thomas is pictured in the group – note also the large letter “C” on the upturned bucket in the group picture. Based on information currently to hand this suggests that Thomas Minshall is being referred to by George Godwin. No service records have been found for “Frank Thornton.” Lowe notes that the Northwich Guardian of Friday 4 September 1914 records that "Mr. Frank Thornton of Bevzky Villa, Winnington had volunteered and been accepted as a trooper with "C" Squadron of the Earl of Chester's Yeomanry. At present he is on the engineering staff at Brunner Mond and Company at Winnington." pictured in the postcards and put names to faces?